Also, a web page -no name -by cldris(a)lasal.net on Ancestry.com World Tree for some of the Driskell family. 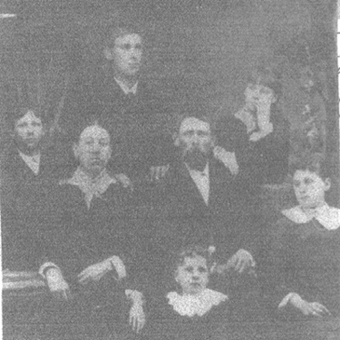 Hiram's children are from Mary L. Coochrane. Tom Kump sent information on the children of Georgia Grindle and Harry H Kump and Harry's death date. Smethers information was sent by Tom Baker. Georgia Lindsey sent information on the family of Georgia Grindle and Harry Kump. A VERY special thank you goes to Shirley Dunnuck !. She went way out of her way to help - even sent me photos of family tombstones and checked out a cemetery in the snow !~!! not to mention checking at an area library. 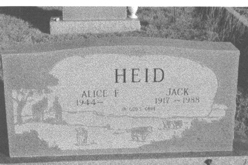 Patricia Sparks, granddaughter of Eunice (DUNNUCK) HEID added greatly with HEID family information. In addition to information she sent photos of tombstones, people, marriage licenses and a Will from her branch of the family and information tracing her line back. Back row: "Fon" (Alphonso), "Lon" (Alonzo), & Rosie. 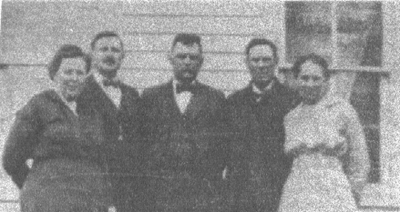 Above: Dunnuck Brothers and Sisters L to R.
Eunice Victoria, Fon (Alphonso) Bill (William J. ), Lon (Alonzo) and Minnie. In Hanover KS. taken at Lewis Kemper farm @1915. 4) Son. b. btw. 1835 & 1840; probably between August 1836- June 1837. The 1840 census shows John & Catherine with three sons under the age of 5. This son is not listed in the 1850 census. 7.Dorothy Loretta "Loretta" ANSDELL b. 4 Jan 1910 Jamestown, KS, in same house as R.A.
+ Thomas Fisher "Tommy" BOOFER May 21, 1922 in Kansas City, MO. by Rilda 6. William Lorraine d.in infancy before 1904 " ? week old"
b. 3 April 1902, Libery NB. d. July 21, 2000 Bloomington , IL. 7. son R. C. D.
As of February 2003, Robert Adair had 12 grandchildren/24 great grandchildren/ 4 great-great grandchildren. Bonnie Jeanne (Dunnuck) GLOTFELTY b. Wymore, NB, July 14, 1926 d. May 16, 2009 of pancreatic cancer. Lankeland, FL. + May 27, 1949 John William Glotfelty of Fairfield,, Keota, IA in the Church of the Brethern. age 4 5. 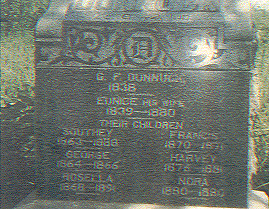 George B. DUNNUCK (1862-1866 KS) or George M.
d/o Jonas/Josiah and Mary SMETHERS both b. Luzerne Co. PA & d. in Gage Co. NB. 6. Fern D. b. ca 1908/09 (living with Bertha & Archie LUKENS in 1930 census. Living with A.G, age 48 ., "Libby"-age 43, Bertha age 17 in 1915. 6. Spencer A. born after 1910 d. age 18 months. buried Stockton, KS. (Harvey later married Alda Millie RANDALL - no issue. + Clyde Adelbert SCOTT m. December 12, 1906. her age was 19, and Clyde's was 25. Clyde's parents were Edward and Henrietta (Jones) Scott. 1930 family living in San Diego, CA. 7.Roe E. b. ca 1909 -age 14 months old in 1910 census for Barneston twp., Gage Co., NB. Alonzo's biography lists brother E.A. as living in Atchison, KS, but also lists a sister as Minnie L. Kemper of Washington KS.. I have a copy of her daughter Blanche's obit giving parents as Egbart and Minnie (Kemper) DUNNUCK. Both are buried in the St. John Catholic Cemetery, Hanover, Washington Co. KS. no children listed in Louise's obit. Name might be Philomenia Blanche. Called Minnie B. in 1920 census 6 Blanche DUNNUCK b. (1912 - 1998) MO. John HEID, Sr. b. 28 July 1873 in PA and d. 27 June 1939 in Flagler, CO. He was the son of Martin Luther and Sophia Marie (Longhorst) HILD Martin & Sophia buried Hanover City Cemetery, Washington Co. KS. 1920 still living Flagler - census dist 133. Obituaries for Victoria and John Click here. 6. Minnie Victoria HEID b. 13 Nov. 1897 Washington, Washington Co. KS. d.7 March 1966 in Portland, OR. Bur. Chapel Hill Memoral Gardens, Littleton, CO.
+ Grace Ruth (withheld) in Stratton, CO 20 January 1920. 1930 census has them in pct. 12, Burlington, Kit Carson Co. CO. Grace was born ca 1896 in CO. They worked in Auto Sales, George was the manager and Grace the bookkeeper. Ralph Raymond "Ray" HEID b. 7 September 1920 in Haworth, Washington Co. KS and d. 5 May 1994 in Adams Co., CO. Buried Elwood Cemeter, Brighton. +Bertha Elizabeth STROHMEYER in Sterling CO., 20 June 1923. 6. Cecil Carlyle HEID, Sr. b. 8 February 1902 in Haworth, Washington Co. CO & d.10 November 1936 in Watkins, CO. In both of Cecil's parent's obits., Cecil's death is listed as 1936-November. Another source has his death as 24 March 1932 - undocumented..
+ Iva (withheld) 20 September 1921. 7. Cecil C. HEID, Jr. b. ca 1924. 6. Ruth Sophia Louise HEID b. 23 October 1908 in Kit Carson Co. CO. d. 9 October 1985 in Hugo Colorado, buried Flagler. +George Howard KELLER on 4 February 1934 in Burlington, CO.
+Zenelda Marcella (withheld) in 26 December1934 Burlington, CO.
6.Eunice Mae HEID b. 8 January 1920 Kit Carson Co., CO. d. 7 October 1971 in Brush, CO, bur. Fairview Cem. Burlington, CO.
+ Andrew Jackson BOYLES in Flagler, CO 24 December 1939. + Americus Evers DRISKELL s/o Mountiliar Gipson. & Emily (AYERS) DRISKILL 29 March 1865 in Marshall Co. KS. The bible page has Mountilian as b. 22 of ?? 1820 in Green Co. OH, and married to Emily Ayers in Washington Co. IA on the 22 day of ---ember 1842. Emily born Oct - st 1826- in Union County, IN. 6. Otie C. DRISKELL May 15, 1874 Washington Co. KS. d. June 26, 1928 Kansas City Kansas. * the bible page has Washington 5. Emily Ann DRISKELL b. Nov 2, 1868 (Washington Co.) KS 2 o'clock in the morning d, March 2, 1851 Loveland, Larimer Co., CO.
George was the brother to Lelia STANLEY, 2nd wife of Edward Sale. 6. Ernest Americus STANLEY b. Aug 20, 1892 in Washington Co KS, d. Feb. 22, 1970 in Little Rock (Pulaaski Co). AR. Two daughters Veneta & Donal. 1930 census for Liberty, (Dist. 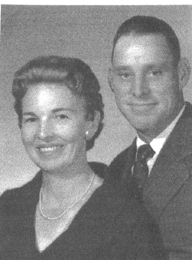 16) Decatur Co. KS - Harry H. age 26, wed age 18 (KS/WI/KS) Farmer, wife Georgia M. age 25, wed age 18 (KS/IA/KS). Two daughters, Veneta G. age 6 and Donnal L. age 3 10/12--.both born KS. d. Dec. 23, 1988 in Topeka KS. Three children: Margaret A. and sons D.G. & J.G. 7. Donal Louise KUMP b. June 1, 1926 in Oberlin, KS d. April 8, 2005 at Longmont CO. cremated. d. January 12, 2004 in Lafayette, CO. 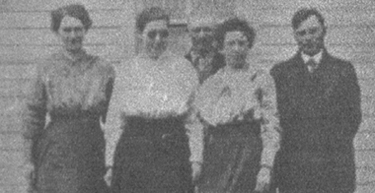 They had 8 children: Noel Patton KEIM II, and 7 others. Charles d. 2003 ID - cremated. + #2 KGL 1983 in ID. born April 1843 in Quebec Canada, 1870 living near the Dunnuck family in Washington Co. KS - age 27 Farmer b. Canada. age 37 in 1880 Farmer - he was ill with TB (Consumption) in 1880 His father born in England, mother in Quebec. brother, Albert appears to be with William A. in 1930 census. 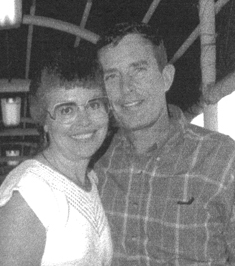 b. January 17, 1916 and d. June 21, 2000 in Las Vagas, Clark Co. NV. + Ruth E. L______ 18 Nov. 1960.
? there is an Evelyn S. Pease who was born 8 December 1916 in Lakewood Cuyahoga Co. OH. She wed Mr Shuster. and lived late in life in Wauseon, Fulton Co. OH. she died 30 June Lucas Co. OH. 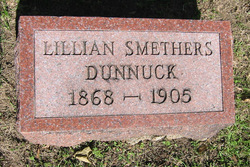 her death certificate lists her mother's maiden name as Dunnick. 6. E.A.P (dau) + ca 1916 in CO.
by #2 5.Everett Elmer DUNNUCK, Sr. b. Feb. 1895. 6. Mary Jane DUNNUCK April 17, 1918 at Marysville, KS. d. April 28, 2004 at the age of 86. Buried Calvary Cemetery, Kansas City, MO. + John J. "Jack" HOGARTY April 25, 1938 in Kansas City, Jackson Co., Kansas. Source: copy of license. Surprise, AZ, age 87 Obit. Published in The Arizona Republic on 10/28/2007. + #2 Elizabeth Ann "Betsy" (ELLIOTT) (widow) KENDALL in August of 1854. Elizabeth was b. 1817 and died Oct. 15, 1878, age 60 years 7 mos. 22 days. d. 4 Feb. 1943 in Morrow County, OR. 5) Roscoe W. b. April 23, 1884 in Oregon - d. 30 April 1902 near Heppner, OR. 5) Craig A. b. Dec. 1894 in Oregon (1920 working as a guard at the state Pen, Walla Walla, Washington in Walla Walla County. 1930 manager of warehouse. + Edna E. b. ca 1900 in NC/NC/VA Married ages 22 & 18 = + ca 1918. 5) Five children deceased before 1900 census - 7 above living. 4) Katherine Ann Dunnuck June 21, 1858. 1876 Spelled with a "K" in father's WILL. Other places it is Catherine Ann 1875 census - age 16. spelled with "c"
1870 census has C.A. Washington Co. KS. 1875 census Hanover, Washington Co., KS Peter Peterson from Denmark - living with the Dunnucks - not yet wed.
1910 census for Forsythe, Rosebud, MT. 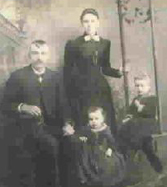 Andrew, Catharine & Rose E.
about 1888 Pete, Catherine & children moved to MT. 1930 census for Smith Co. KS Pete, age 80 is living with son Clarence. + Peter PETERSON ** + Anders Peder Pedersen They wed after 1875. Clarence William Peterson about. b. 16 Nov 1876, d. 19 Oct 1964 Bethany Cem., Smith Co., KS. WW1 draft registration has tall, medium build, blue eyes, light hair. b. 18 May 1908, in KS d. 22 Sep 1999 buried Bethany Cemetery, Smith Co. KS. Tall, Medium build, blue eyes, brown hair. 1880 ** census -- There is an Andrew P/or/D Peterson in Pawnee twp., Smith Co.KS Census dist 302, page 5 his wife is a Catherine A/or/N Peterson she is 21 which is consistent and she was born in IN/MD/IN which is also consistant. They have two children Clarence age 3 and Esta age2 (listed as a son) I wonder if this could be our Catherine DUNNUCK. // on Ancestry.com under public member trees (2008) under Peterson family, I find the listing of children - above. This source used Catherine Ann with a "C"